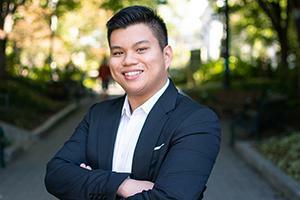 Jason Javier, BSA ‘19, takes experiential learning to the next level. He recently accepted a position with EY in Berlin, Germany, strengthening his global perspective full-time within the “Big Four” accounting firm. It’s essential to understand his passion for new cultures and languages to also understand his journey at American University. After taking a German course in his first year, Javier knew he had to experience the country’s culture up-close. In spring 2018, he spent the semester studying at the WHU – Otto Beisheim School of Management. Javier said was initially hesitant to apply because of its competitive reputation, but, “if you have the capability and if you study the language, take the risk,” Javier said. He relished Vallendar’s multinational culture, being exposed to a new community of industry leaders, and learning from business students from across the globe. Once back in the US, he transitioned back to life at Kogod, as well as life in the professional world in DC. Javier began an internship with EY in Tyson’s Corner, Virginia—but it wasn’t long before he was called back to Germany. He joined the company’s Global Student Experience program, which placed him at one of EY’s branches in Berlin. For Javier, his experience at EY and with German work culture was defining. He traveled to client’s work sites, helped with financial reporting, and experienced a completely new approach to business. He was particularly struck by how transparent his supervisors were with the difference he was making in the company. “I felt like I was adding value to the team, more than I'd ever felt before,” he said. After another highly selective interview process, Javier accepted a full-time position with EY in Berlin. His expected start date is November 2019. As a global citizen, now Javier hopes to bring American perspectives to Germany, and to continue to identify ways for each country to help the triple bottom line of people, planet, and profit. He ultimately hopes to affect change in the workplace by becoming a Certified Public Accountant, helping others plan and reach their financial goals. Learn more about Kogod’s bachelor of science in accounting program.